Chelmno was established to kill Jews from the Lodz ghetto and other towns in the administrative unit called Warthegau. Poison gas was first used in Chelmno to kill Jews. The camp had three gas vans, two small ones and one big one. The official names for the lorries were Sonderwagons. 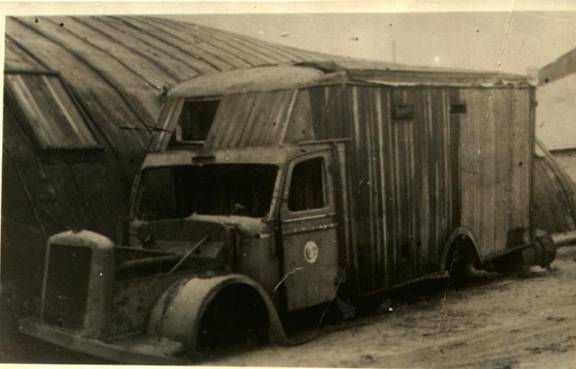 The camp didn’t have repair shops for the gas vans, so they were repaired at shops in Kolo. 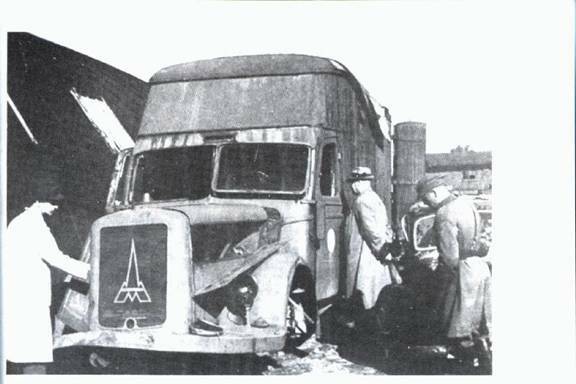 Polish mechanics that worked on the lorries said the large van was twenty feet by ten feet, holding about 150 people and that the little vans were sixteen feet by eight feet, holding 80 by 100 people each. The double doors of the lorries were airtight. The vans had narrow boards that were over-lapped to make them look like they were armored. The gas vans were painted dark gray. They looked like normal moving vans. The drivers wore gas masks so they wouldn’t die along with the Jews. Chelmno was made up of two parts. There was the Schlosslager, a manor house where the Jews were kept and killed. And there was the Waldlager. It was in the Rzuchowski Forest. The Jews were burnt and buried here. Chelmno was by the Powiercie station The Jews were shipped on trains from the Kolo junction to the Powiercie station. Then trucks took them to Schlosslager. When the Jews got there they were put in the courtyard. They thought they were going to work at a labor camp. They were told they were going to take a bath and to undress. All their valuable stuff was taken away. The Jews were not in separate groups of men, women, and children then they were killed, they were all mixed together. On the walls were signs pointing “To the Washroom” or “To the Bath” that made the Jews believe that they were actually going to the bath. Then, they would be ran down a ramp into a van and locked in. They would die from the lorry’s exhaust and driven to the Waldlager in the Rzuchowski Forest to be burnt and buried. The Jews were burned in the two crematoria built in 1942. They were destroyed April 7, 1943, and rebuilt a year later. They could hold 100 at a time. Some Jews wouldn’t be killed. They would work for the Sonderkommando, a forced-labor group. The Sonderkommando would unload the dead Jews, buried them, burned them, cleaned lorries, and sorted clothing. Every once and a while they would be killed and fresh, new Jews would take their place. They started using gas vans on December 8, 1941. In March 1943 they stopped. Not as many Jews were taken to the camp in March 1943 because they had killed most of the Jews in Warthegau. The camp closed down for a little while, but started up again in June 1944 since there were more Jews to kill. Jews from Warthegau and a couple hundred Poles and Soviet prisoners of war were killed in the Chelmno extermination camp. Gypsies from Austria and the Lodz ghetto were some of the first to die at Chelmno. The Germans made the Jews burn the dead Jews they had buried to get rid of evidence of the camp. They killed the rest of the Jews and left the camp on January 17, 1945, as the Soviet Army came. 152,000 Jewish people died in Chelmno. The only survivors were Srebrnik and Zurawski.